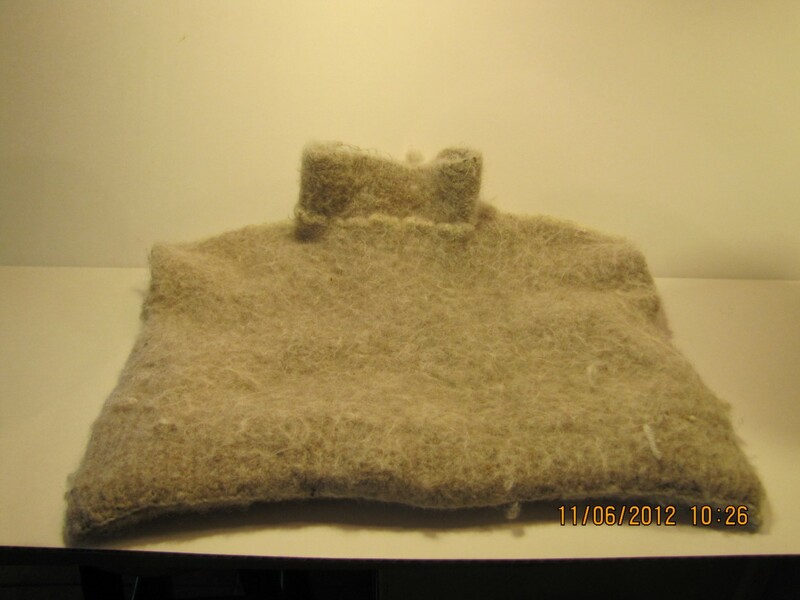 Pinterest Project #9 is a wool sweater felted and turned bag. This project actually started a couple of years ago. I bought an Irish Fisherman’s Sweater on Ebay hoping to felt it for something. 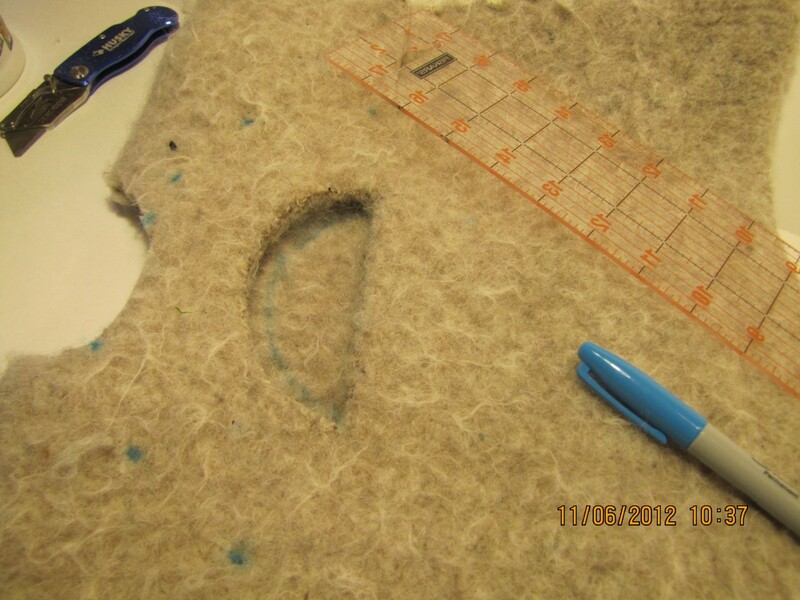 When I got the darn thing, it had obviously already begun the felting process. Hmmmmm. A work in progress. I pinned this. And found the instructions here. I’ve been felting for a long time starting with hats and moving on to bags. I didn’t think there would be a problem with this one. That sweater was a bit of a problem. 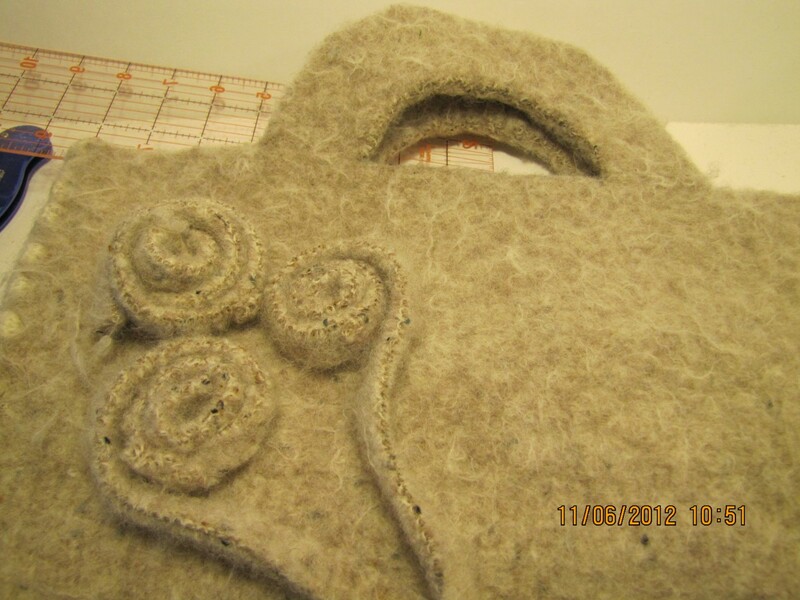 Once felted it was too small to create a bag similar to the one I pinned. So I pondered the problem and decided to go with the small tote in the pic. It works for me. Turning that puppy inside out was a struggle, but I prevailed. Use the small load setting on washer, hot water, a little soap. Use the setting you use for towels and a fast/fast agitator speed. Run a second rinse if available. Add 100% wool sweater to machine. Remove sweater from machine, smooth, and dry flat. Remove the sleeves and the collar. 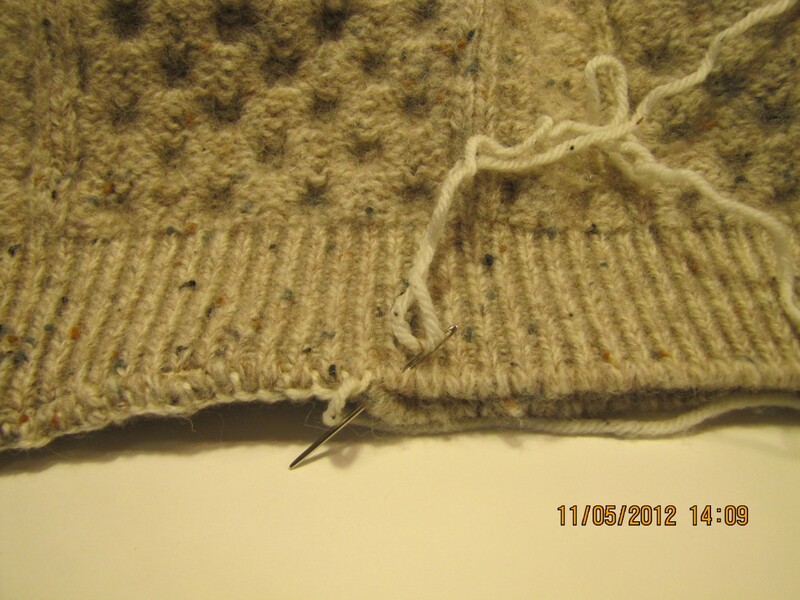 Place a straight edge across the sweater at the bottom of the openings created by removing the sleeves. Find a circular object (I used the doggie dish) and center on the straight edge, leaving about 2 inches of felted fabric above the circular object. Using a Sharpie or fabric marker, mark around the top of the circular; remove the circular and mark a straight line creating a half circle for the opening. **Cut the half circle. Use an Xacto or utility knife to start. Finish cutting with scissors. Mark the half circle on the opposite side using the cut out as guide. Measure from the cut semi-circular opening 2 (+ -) inches toward sides and top, marking every inch or so for handles. 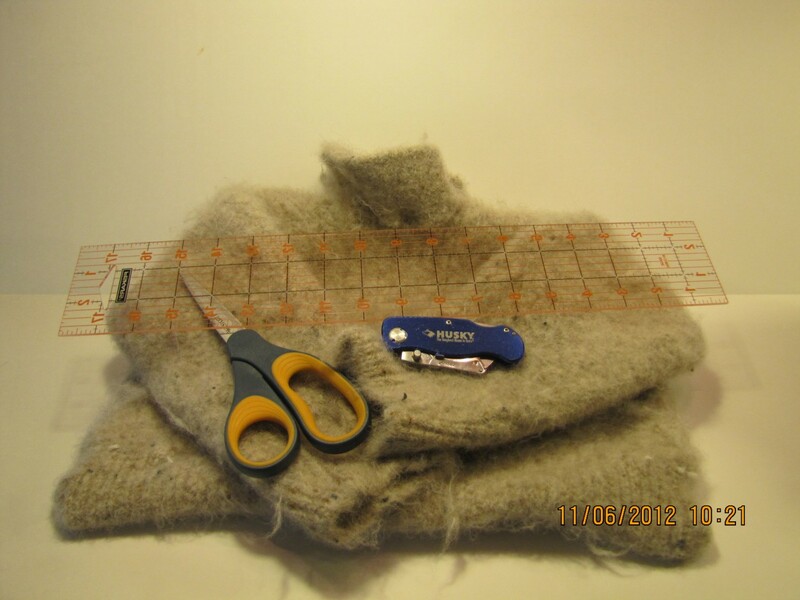 Cut straight across from sleeve opening to 2 (+ -) inches before the handle opening. Repeat on opposite side. Repeat from ** on opposite side. 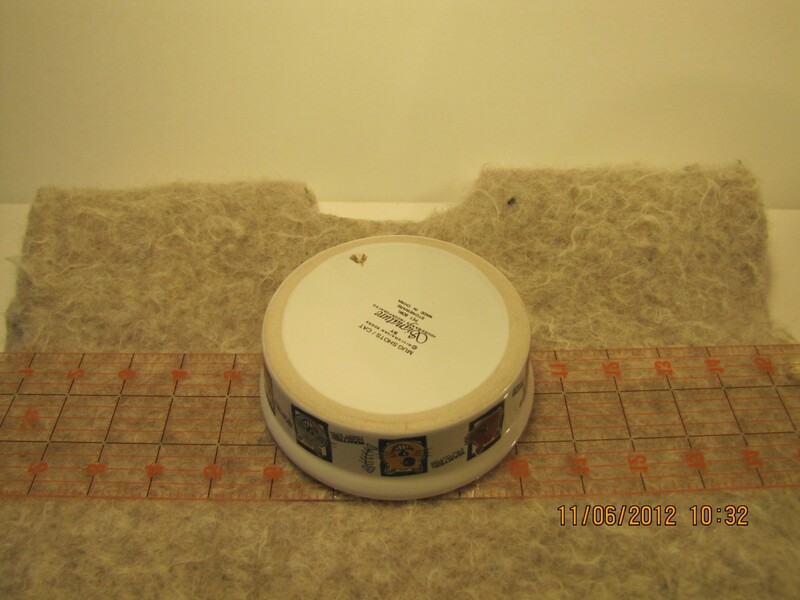 If desired, and using scraps, cut narrow strips ¼ to 3/8” wide, roll and stitch for flower. Fold handles in half toward inside and stitch together. We’ll need a pic update with the sewn handles. Oops! This will make a great project bag, or a good place to keep my crochet hooks and knitting needles. They have their own little cases, but one spot to hold them all might be useful! That’s it for the Tuesday Tute! I like this one, too! I had a wonderful sweater that somehow managed to wind up in the washer on warm. So, hmm. Wonder what happened to it??? Will have to look around for it. Thank you. I will be following your work! I have such a great love of animals. I would adopt them all, but the vet bills would kill me! Ohhhh…take care of your baby! I’m headed to our vet for Comfortis…only thing working for fleas here now….resistant little devils. P.S. Forgive my manners, thank you for stopping by my site. No need. We are all in this together. I’ve watched my wife do some felting with alpaca fleece, so I have at least some appreciation for how much work this is. You also do an excellent job of explaining and showing how to do it — through clear words and photographs — a skill most people don’t seem to have. Thank you! Your encouragement is most appreciated. By the way, I love your blog. Your writings amuse me greatly!